After experiencing his own radical transformation, Drew Canole has dedicated his life to helping millions of others lose weight and reach optimal health through the power of juicing vegetables and Superfoods. Will you be next? The best part is, Organifi Green Juice has just made this faster, easier and absolutely DELICIOUS! For more exciting tips on reaching your health, fitness and lifestyle goals, you can catch Drew on his popular blog show at “www.FitLife.TV”. Slice 20 Years Off Of The Way You Feel In The Morning! So What’s The Recipe For Organifi Gold? It’s been used for over 4,000 years. Ancient India and even China recognized turmeric as a powerful restorative root. Today, over 2,000 peer reviewed studies suggest turmeric’s power. Here, we’ve included a full clinically tested dose. Plus, our unique, proprietary harvesting method makes each dose 4 times more powerful! You can see: We really put our noses to the grindstone to guarantee your body absorbs these super-powerful herbs and feels the effects quickly! Those 4 “tricks” above are what give this Gold elixir it’s MAXIMUM STRENGTH! "TBD" Individual results may vary. It’s true. “Slice” 20 years off the way you feel in the morning. Move your shoulders and knees smoothly. Antioxidants are miracle helpers. They have a certain way of “welding the wiring” between cells. When your cells can communicate better, your immune system is unstoppable. Nobody likes not feeling well through the night - it is completely miserable. Now, flu season doesn’t stand a chance. How much is it worth? This recipe has the clinically tested doses of several superfoods you might see sold individually. Many women and men over 40 already purchase individual supplements for each of these issues above. Finally, they are all here together in a much more affordable solution! It’s only 10 seconds. It mixes smooth. It’s creamy and delicious. It’s never been easier to take such powerful, natural superfoods to rejuvenate your body, relax, and feel better. That Makes Restorative Herbs Up To 2000% Stronger! It’s another absorbability “hack.” Acacia fiber is actually an organic tree sap. More importantly, it’s “food” for the bacteria in your gut. You’ve heard of probiotics? Prebiotics feed the probiotics. This ensures proper digestion of all 8 previous ingredients for MAXIMUM strength and absorbability. Think back: Maybe you remember your mother or grandmother making a healing tea when you were sick. How did it make you feel? It was warm. It was comforting. It soothed your bones... maybe even your soul. Now’s your chance. This Golden Tea idea has been brewing for a while. We spent time. My friends and family here at Organifi have been working hard. We researched the most miraculous herbs for discomfort. We studied the most powerful natural superfoods and nutrients for deep sleep. Then we added the miraculous superfoods for immunity. We mixed. We tested. We tasted. Finally. It’s only $1.98 a day. It’s my promise to bring you the most potent, all organic, trusted superfoods, in a pure, gently dried mix, saving you money, and time. Drink It Warm, Like A Tea! 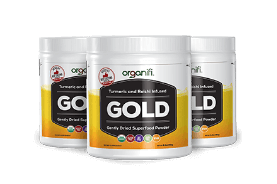 "I love the Organifi Gold… it really relaxes me at night. There are some nights where I still carry all the stress of the day with me… it just helps me relax a little bit more. I get a little better sleep with it.” Individual results may vary. "Sleep is our time to rest and repair. So no matter what health concern you’re working on, sleep is going to help get you there - to the healing process. [Organifi Gold] is going to help you stay asleep, and wake up rested. I love… having something that’s safe and effective for my patients to be able to use." Individual results may vary. 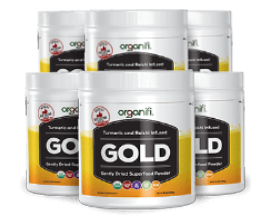 "I love Organifi Gold because it’s a perfect way end to the day. I know it’s great for recovery with the turmeric and ginger… it’s my late night snack.” Individual results may vary.